BASKETBALL SPOTLIGHT NEWS: Basketball Spotlight Exclusive: Is DJ Wagner Camden's Next Messiah? DJ Wagner and Dajaun Wagner Sr. When your father is the NJ’s All Time leading scorer and considered the greatest player in the state’s history those are big shoes to fill. 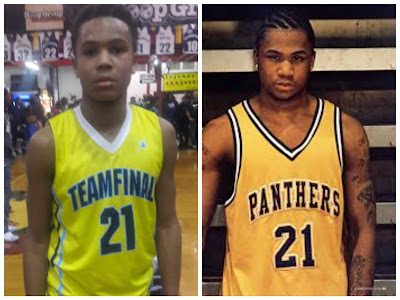 This is the case with Dajuan Wagner Jr. of Team Final. The 8th Grader is a year away of donning the purple and yellow of the mighty Camden High. Does he have what it takes to be the Camden’s next Messiah? We sat down with Team Final Coach Aaron Burt for some insight. BS: How early did you know DJ was a special player? AB: I think DJ was a special athlete at an early age playing football. I don’t think anyone though he would play basketball because he was such a dominant running back. Then he began googling and studying his dad. But last year we saw he was a little different. There’s not a day he doesn’t workout. BS: How does his game compares to his father? AB: He’s very comparable to his father and grandfather. He’s built more like Milt (Grandfather. He has the mentality of both when it comes to winning. The difference is that DJ wants everyone to be as good as him. He doesn’t know good he could be. Milt and Dajuan Sr. knew they were different and showed you every moment. BS: How do you think he will handle the pressure of being the “Heir Apparent” for Camden? AB: He will be fine taking over at Camden High School. He could start for them right now and be a major contributor and leader. You will see a city behind him and South Jersey will have packed gyms once again. His family will keep him humble and hungry. He’s such a better person than basketball player. This has been a Basketball Spotlight exclusive and stay tuned as we bring you more articles on top players in the country. Dajuan Wagner Jr. Getting Busy At Spotlight!